This photo was taken on Jan 13, 2012 at midday. The location was in the beach front restaurant at the hotel in which I was staying in Aruba. The "Take It" came from the eye catching difference in the serving tray being used by the waitress. I had never seen a tray of this type with holes in it before. The reasons for the holes were quickly obvious and the genius in making them, one of those immediate mixes of gathering in the impression with the tandem appreciation of the solution to the problem of the constant gusting of the wind. Part of what makes this work is that all the drinking containers are made from plastic which is standard practice for bare feet locations along with increased chance for drop and spill. The bounce doesn't break principal being in full play here. That the drink containers slip down into the tray rather cup holder like, helps bring about a more stable situation with the lowering of the center of gravity and of course the firm positioning of each of them. I also am extremely fond of the dexterity being shown by this server in the positioning of her fingers for optimum efficiency. That she has laid the can of Coke on its side so that it is not top heavy and precarious as would be the case if it were placed upright. Matched up with her thumb having been extended through one of the holes forming one of the basic anchors for holding the tray and at the same time using the middle of the ball of the thumb to bring both side stability to the can. Yet another little push of the can toward the inside edge of the tray, all a part of what must call the hand of experience. That she had another finger extended through another hole with just the proper crook being used to bring about yet another set of measures of stability to the can with tandem push to the inside rim with the thumb. All while forming yet another grip point on the inside of a knuckle for the basic function of holding the tray up and steady. Then there is that other semi crooked finger that is visible through the hole extending accross the hole bringing stability and serving as a major load bearing point on the inside of the end of the finger. The server also has a glass of water in her other hand which looks like it might not fit the hole configuration of the tray. Under her arm it looks like she has a check presentation folder with some of the check sticking out presumably for some set purpose. This kind lady who let me take several photographs of her busy self sort of mid moment was wearing comfortable shoes and a uniform that was wonderfully appropriate to the setting. It all happened in a brief pleasant exchange with me lauding her talent, she sort of doing her rendition of "pshaww", and both of us enjoying the fun of it all. I was able to reach into my pocket and inside there, roll up several of what I knew were one dollar bils and bring out my hand and slide the tight roll of bills into that upturned finger on the tray. This was to her protest, with me laughing and thanking her for her time. She walked away laughingly muttering as there was no way to return the bills to me without having yet a further disruption to her busy time. The After Take: This was one of those joyful exchanges that sometimes can happen in life. Looking at the photo brings it all back, as is often the case and is the intent of photography. And "Oh Yes!" lest I forget, May this be in no small part a tribute to the genius of the inventor of the tray. 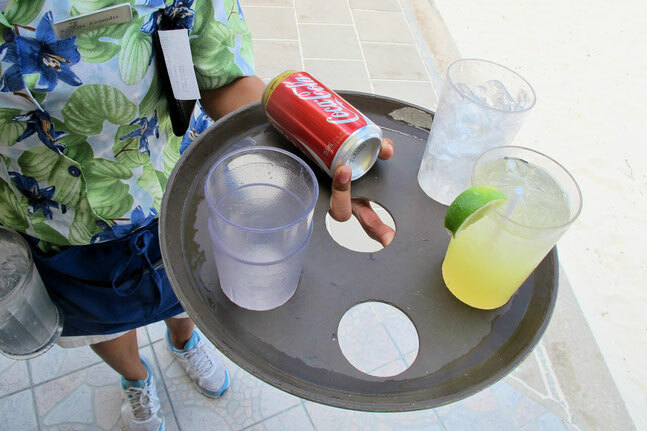 I cannot help but imagine the inventor watching many a tray with drinks go tragically flying in the constant gusts that are happening ten months out of the year (so I was told). I hope the deliberation to bring about this seemingly simple solution did not take long, as the situation called for an answer as soon as possible. Again, cudos, many many cudos for all those wonderful refreshing drinks delivered safely in no small part because of you. And so, to the decomissioner, of the formerly flying saucer; our sincere thanks. Thanks for joining me as I sit here in my little home office using my lap top in the attempt to describe with words the thousand already presented in the photograph. Happy time for me and hopefully you as well. What kind of drink did she bring you? Mojito's and Margarita's all the way!